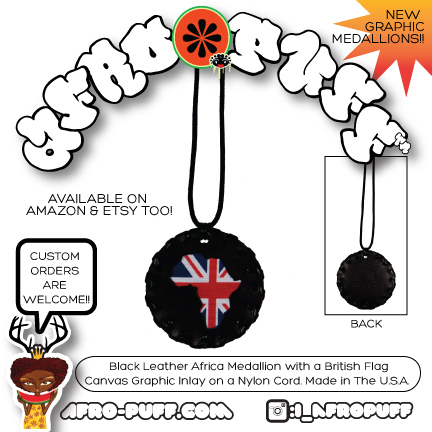 3 inch black leather medallion with black wooden beads on a nylon cord. Metallic gold leather clutch with hand painted embellishments. Leather Handmade and Handpainted Fairy Pouch hand laced with calfskin leather with a nylon drawstring cord. I finally have my struggle fist medallion produced. All your requests have been heard. 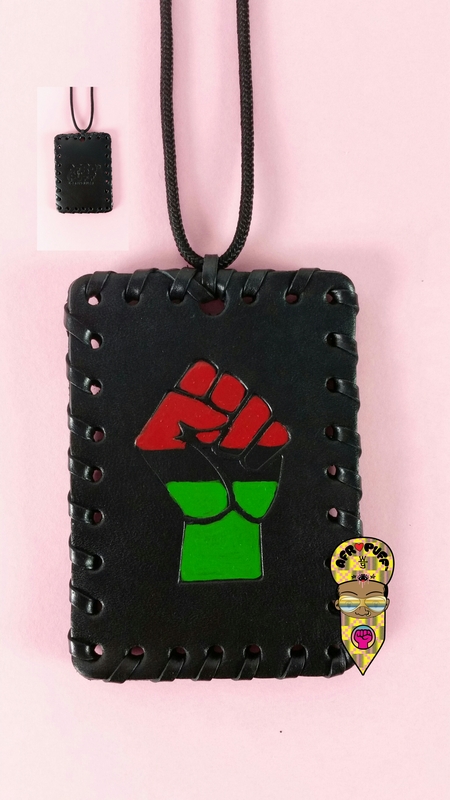 The fist is stamped and hand painted in the Pan African Colorway. Currently available in my Etsy shop. So Im gonna be a panelist on FlashTag / StreetArt Discussion at CAAM Saturday in Expositon Park. This is a really unique event. I hope to see a great turn out. 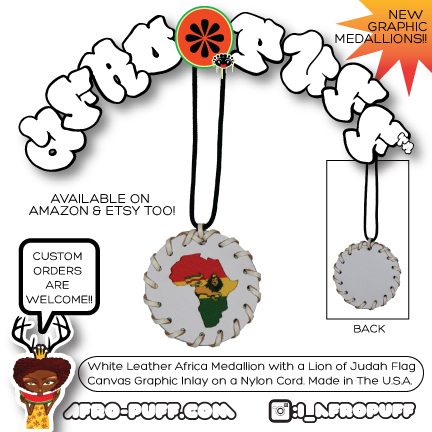 Lion of Judah Medallion in White Leather. So a couple of weeks ago, (it took a week to recover) I was a featured artist at The L.A. ArtShow through the Diversity L.A. Program. I was give a Huge 10×20 space to do my thing. It took months of planning and for the first time I worked with a curator, the wonderful Mar Hollingsworth from CAAM and James Ponozzo from LA Launch. It was a Amazing Experience. I gave interviews, saw old friends and colleagues and met new folks as well. I could go on and on but its just too much to unpack here. But Here are a few Pics of the Boho Highs and Visual DriveBys event space and some friends. Thank You to everyone involved. It was a great success. 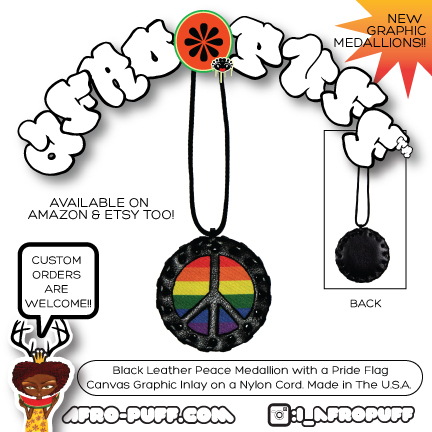 —>Now Available has in the Rasta colorway! 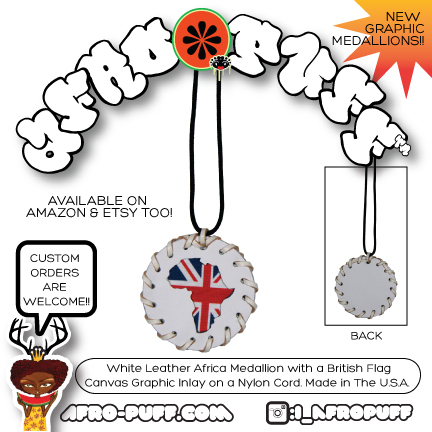 One of Kind Limited Edition Handmade. 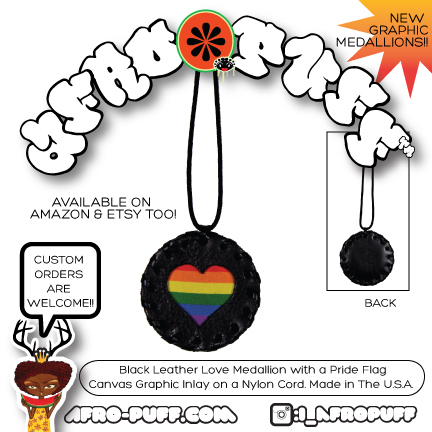 I’m hav having a flash sale through the weekend. Deep discounts online only. I’m having a Flash Online Sale through the weekend. Deep Discounts on OOAK & Popular items. I put some paintings up for sale on The AfroPuff Shop website. Im gonna list and hopefully sell some paintings, prints, and dolls so that I’ll be able to keep my studio open and keep on creating into the new year. Thanks for All The Your Support. Here’s the Link to Buy. ICYMI New Downloadable Planner WorkSheets Now Available!